A few weeks ago, I took a long weekend trip to DC. A friend invited me to join him for an event in the city, and I decided to stay an extra day so that I had some time to enjoy and explore. I'll talk more about the event in tomorrow's post, but today, I want to recap the rest of my trip. I stayed at The Mayflower Hotel, which is by far the most beautiful hotel that I've ever stayed in. 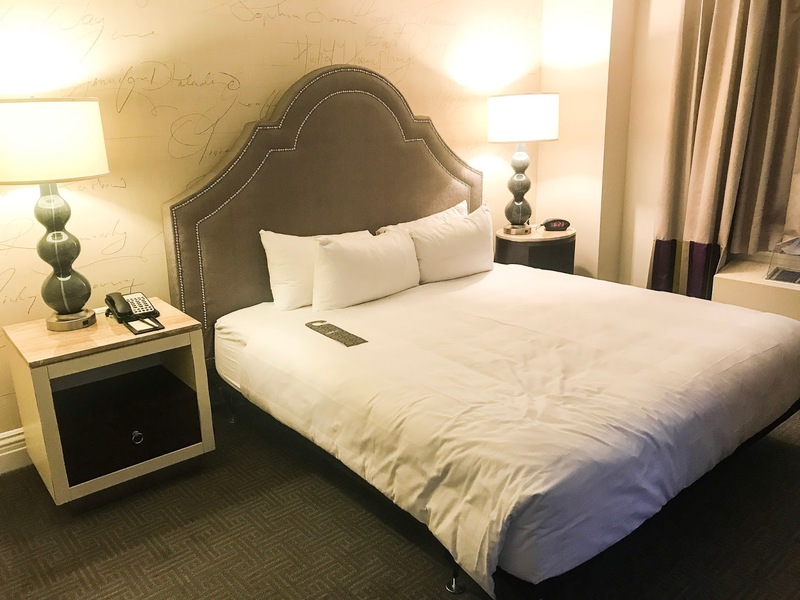 It's in the heart of downtown DC, maybe a 10 minute walk from the White House. 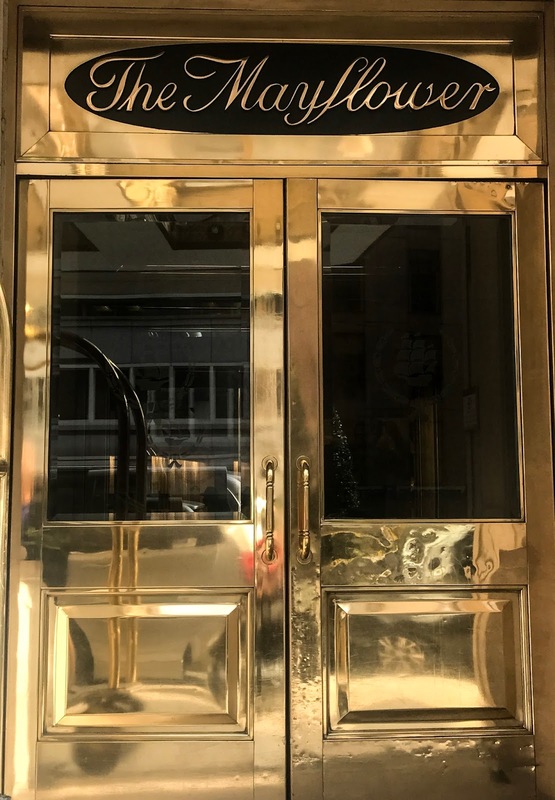 It opened in 1925, and has hosted inaugural balls, numerous Presidents, and many heads of state - the hotel actually had historic photographs and other memorabilia on display in the mezzanine level. 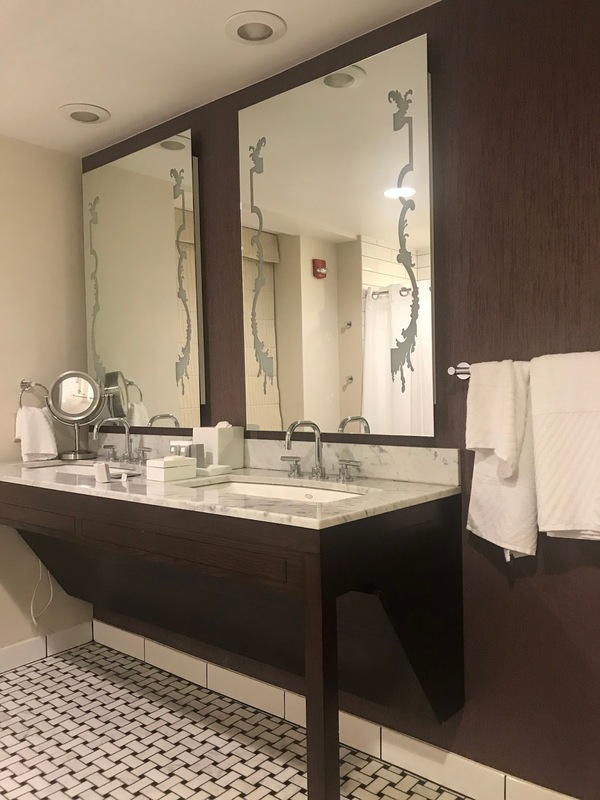 We stayed in a suite, which was incredibly spacious, and I'm always impressed with hotels that offer accessible suites with roll-in showers - they're actually very difficult to find! Since my whole family made the trip to DC, there's just not enough room for me and my sister to move around if we don't stay in a suite. 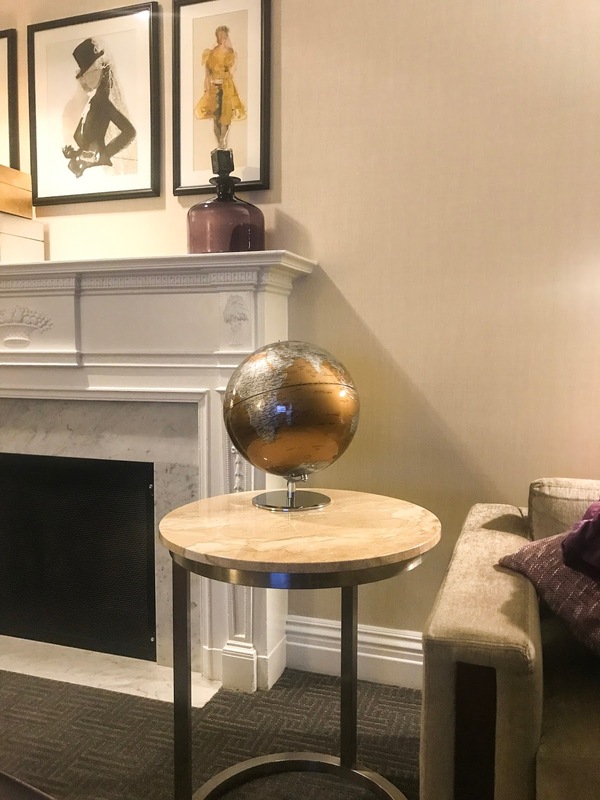 I loved the decor of the room and the hotel - how cute are the fireplace and the globe? The bathroom was so huge it was almost unbelievable - more than enough room for me and my sister to get ready at the same time! They also had a little light-up makeup mirror in addition to the huge mirrors on the wall! I always pack a small stand mirror when I travel, and it was great to not have to unpack it. I was busy all day Saturday with events, but had time on Sunday to walk around. I didn't plan this, but I was delighted to find out that the National Geographic Museum was right behind our hotel. When I found out that the current exhibit was wildlife photographs, I knew I had to go! I loved all the pictures, and it was fascinating to read the stories behind the shots and to watch the video clips they had playing throughout. I had to get a picture outside with their sculpture for their Big Cats Initiative, which was started by a husband and wife filmmaker/conservationist team. Big cats are my favorite, and I have a framed print in my bedroom that supports the Big Cat Initiative! We had dinner reservations, so we didn't end up with too much time between the museum and dinner, and decided to just walk towards the National Mall. We ended up having time to walk to the Washington Monument, and I made mental plans to come back in 2019 when the elevators are operational again so I can ride up to the top! It really is an amazing and awe-inspiring moment - you don't really grasp the size of it until you're up close. I never feel like I have enough time in DC - I really love just walking around and finding new coffee shops and restaurants to try. I can't wait to tell you about the rest of my trip tomorrow, and I also already can't wait to go back to DC!